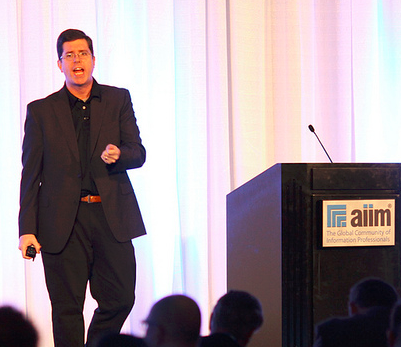 In March, I gave a keynote at the annual AIIM Conference. 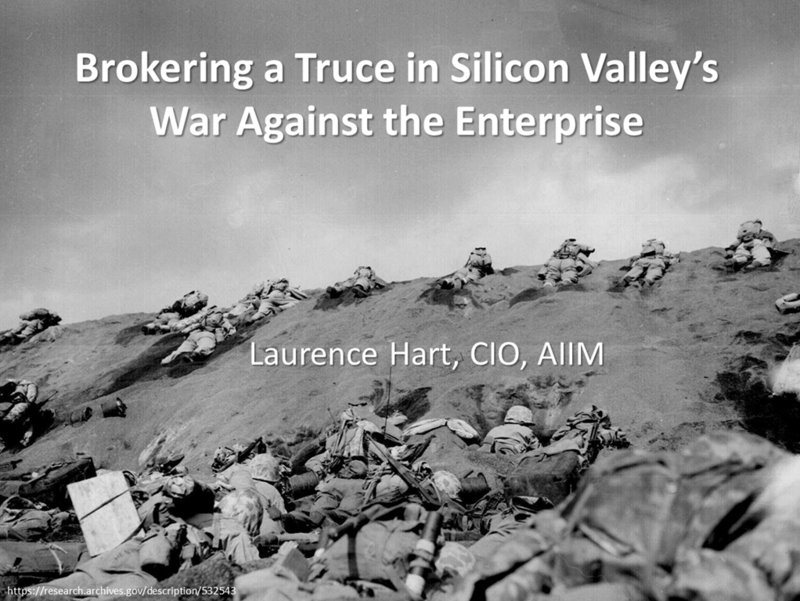 It was based upon my post, Silicon Valley’s War on the Enterprise. I’ve been hoping to share the video with everyone, but that doesn’t seem probable due to some bad luck. Given that it is a very text-light presentation, I am going to try something new. I’m going to walked you through the whole thing…..
You are looking at a picture of the U.S. Marines of the 5th Division inching their way up a slope on Red Beach No. 1 toward Mount Surbachi Yama on Iwo Jima, February 19, 1945. World War II was a war that was simple to understand. The enemies were easy to identify and everyone involved knew the stakes. We are now witnessing a different kind of war. It is a war for the rights to manage our information. It is being fought behind the scenes with subtle moves and claims of innocence. Silicon Valley isn’t just targeting the Enterprise. They are targeting the establishment as a whole. One merely has to look at how Uber to see it in action in a not so subtle way. For those that don’t know about Uber, they are a “taxi” service where you hail the “cab” electronically. Pricing is based on demand and the vehicles are those black executive cars that are looking for some extra money between pickups. You pay on the phone so you never have to worry about having cash. It costs more but removes a lot of random luck from the cab game. And it upsets cab commissions all over the county. It isn’t regulated and depending on who you ask, it may be illegal in some cities. Does Uber care? No. They hire lawyers, look for the loopholes in the regulations, and move forward. While the war against the Enterprise isn’t quite so obvious, it is just as aggressive. 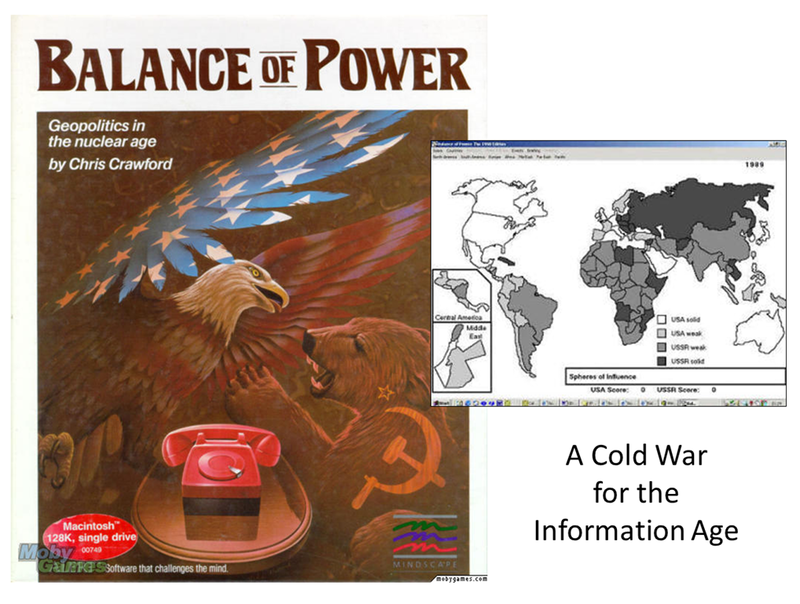 It is a Cold War where organizations are the prize, not third world countries. Balance of Power is a game that I spent quite a bit of time playing in my teenage years. I grew up under the specter of a nuclear war between the U.S. and the U.S.S.R. 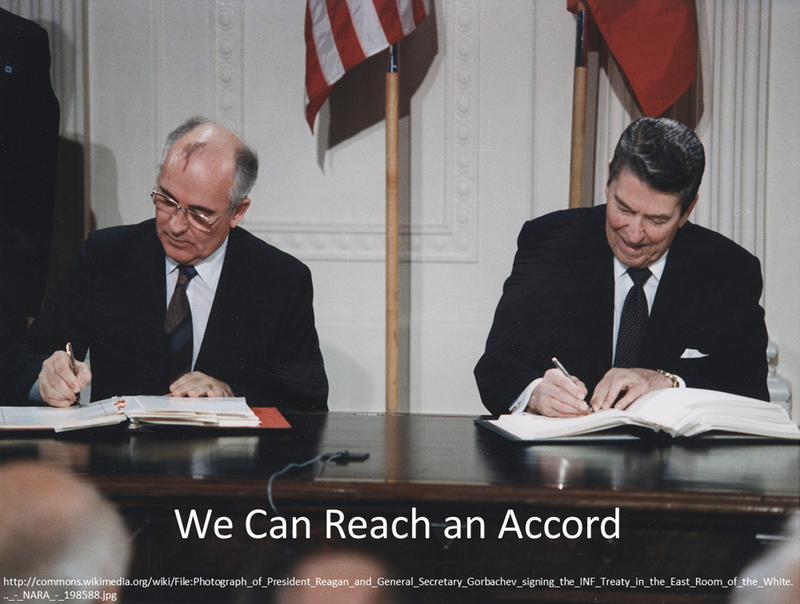 It was a “Cold” War that wasn’t going to have a winner if it went on too much longer. In the game, you would pick a side. Your goal was to sway the world to your world view by assisting countries, or that country’s opposition, with financial or military aid. This would gain you influence. The goal was to have more influence in the world than your opponent…without blowing the world into smithereens. After giving support to a country, your opponent could object. It could go back and forth, escalating the crisis. Typically, I would back down at DefCon 1 or 2 in order to avoid war. Of course, every now and then the other side would start the war, ending the game, on DefCon 2. At least half my games had no winner. Loved that game. We are seeing the same thing now. Bit-by-bit, person-by-person, office-by-office, the cloud vendors are slowly working their way into the Enterprise, all in the name of helping people. How are they able to do this? 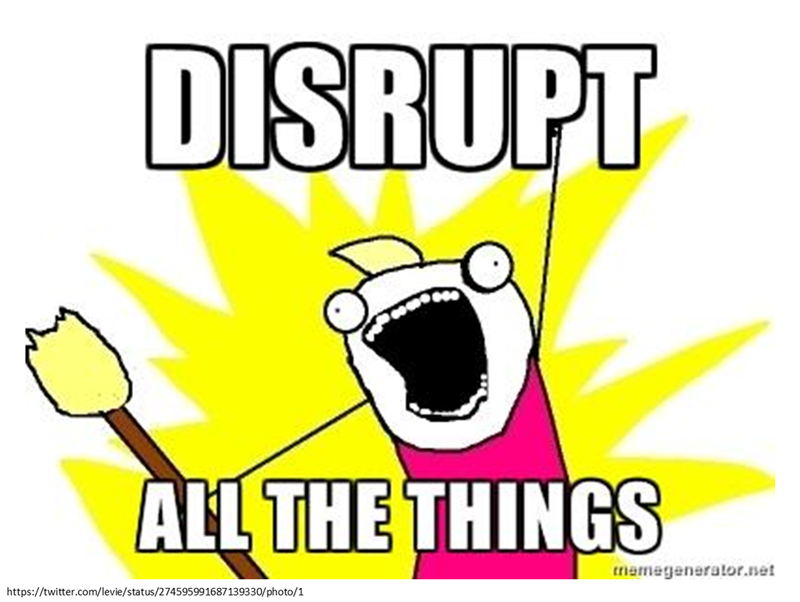 We are ripe for disruption because we have failed. When I say we, I am not excusing myself. Look at this statistic. Only a THIRD of organizations are DECREASING their volume of paper records. Are you ready for the bad news. This is from an AIIM survey where a majority of respondents understand the principles of managing electronic records. These are people who know better. Every study I see says that more than half of all IT project fail. When you focus on just Information Management projects, the rate of failure is higher. Think about this for a second. If you have a successful project, you are the EXCEPTION! Think on this for a minute. After almost 20 years in this business, we still can’t be successful more than we fail. Why are the cloud vendors gaining so much traction? Because people need something that works for them. Look at the above chart. 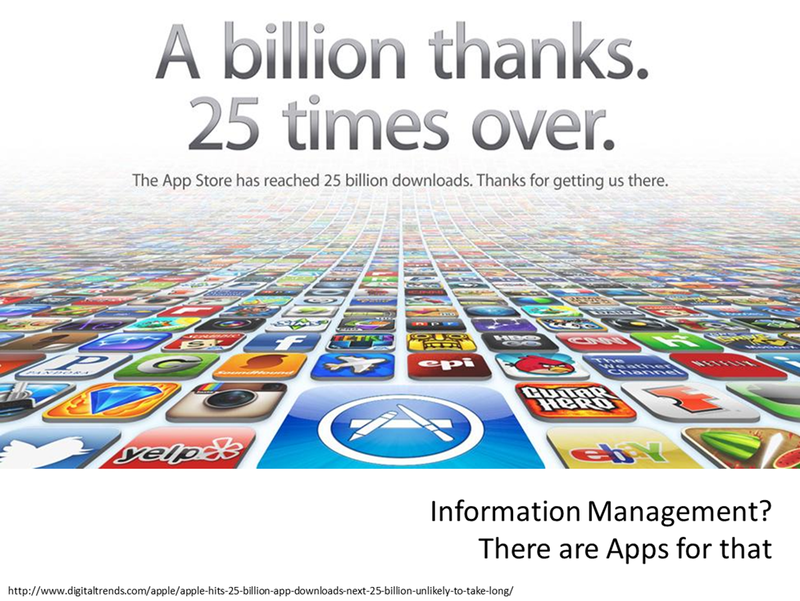 It is from another AIIM survey in the fall of 2012. 22% don’t know if people in their organization are using these cloud tools. I once found DropBox on someone’s computer and they didn’t remember installing it. They just had started using it. 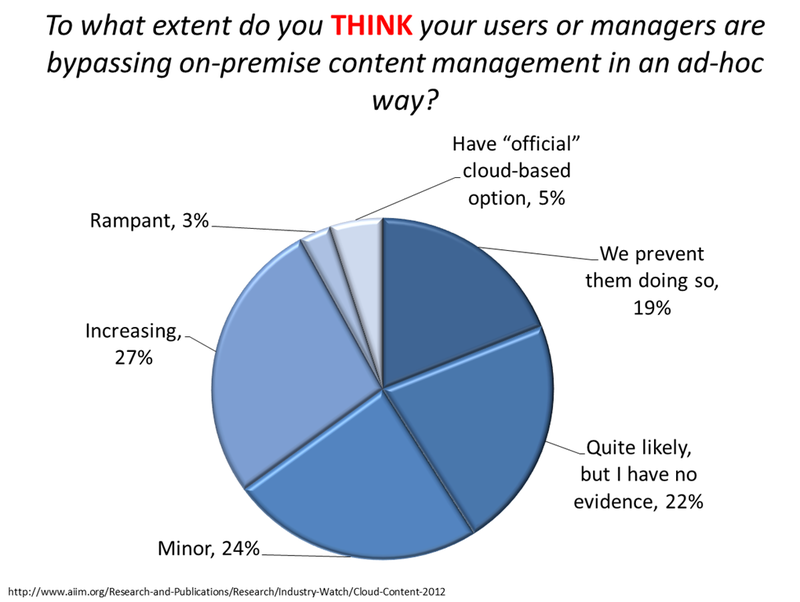 19% say they prevent users from using cloud tools. With that in mind, think on the next stat measured during the same timeframe. Think on that for a second. 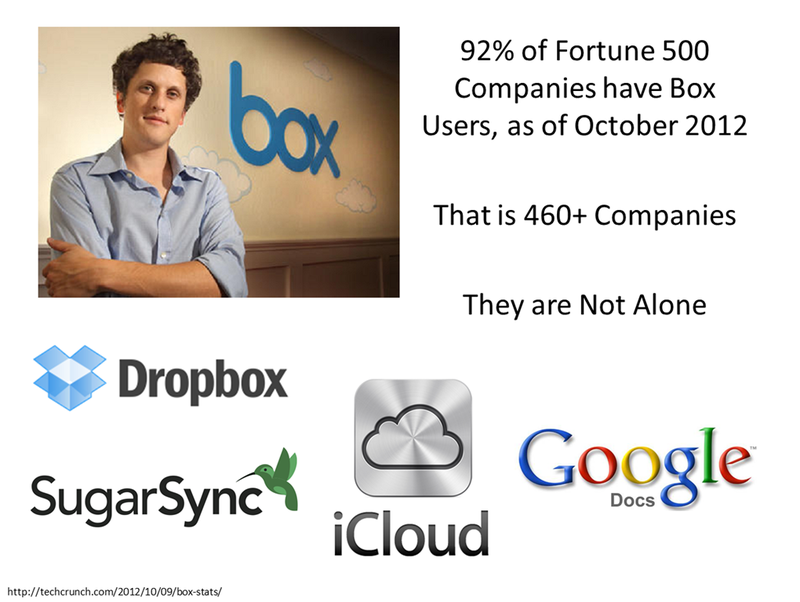 Only 8% of the Fortune 500 do not have 3 or more employees using a Box account with their work account. That doesn’t count personal email accounts or the multitudes more that are using Dropbox of one of these other solutions. When you compare that 8% with the 19%, you realize that nobody really knows the full extent that these tools are being used as it cannot be controlled. This problem does’t even consider vendors that have been bought by traditional Content Management vendors (Syncplicity) or tools that those traditional vendors(Open Text, Microsoft, Alfresco…) have developed. It is just those companies with Cloud DNA. The cloud vendors love this. They are getting in through the backdoor. They are exploiting the failures, problems, and frustrations faced by people every day. When they see a company with a large number of registrations, they simple call them up and offer them an Enterprise license. People buy because it allows them some measure of control. After all, f people are using those tools, instead of blocking the tool, you need to find out why they are using it. What is the gap in the current solutions provided to your people. There are systems out there can address some of those concerns, and not all are cloud-based. If you don’t solve the core problem, people will just find another way around your restrictions. This is the only way it usually works. Frequently when people ask for help from IT, they don’t always get the help they need. IT loves to say No. They say it because they are worried about losing control. They say it because they fear change. They say it because they feel that the tools are purely redundant. Whatever the reason, they say No. This drives the staff right into the arms of the enemy. People are driven underground. They go and become their own Shadow IT department. Need an Electronic Signature? There’s an app for that. Need a fax? There’s an app for that. Need to access SharePoint from your mobile device? There’s an app for that. 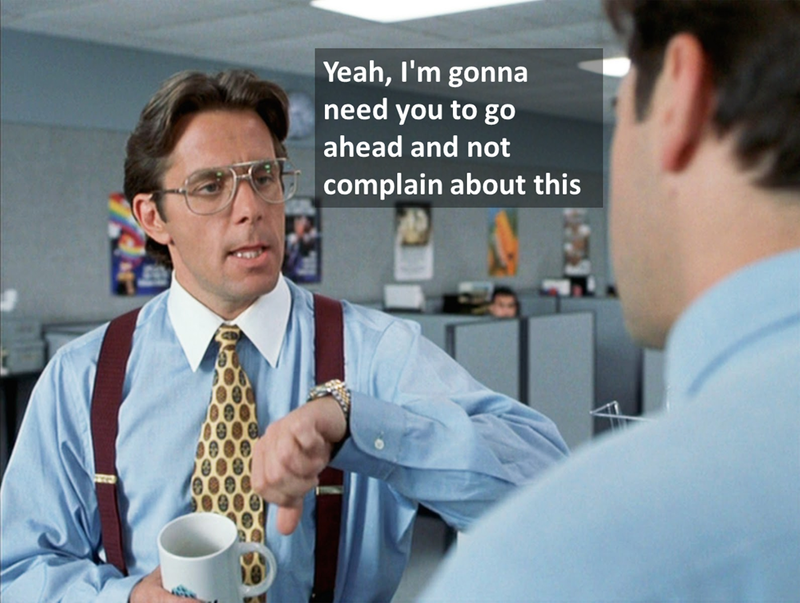 Have an Information Management challenge? There’s an app for that. Which begs the question: After all these years, what are we still doing wrong? 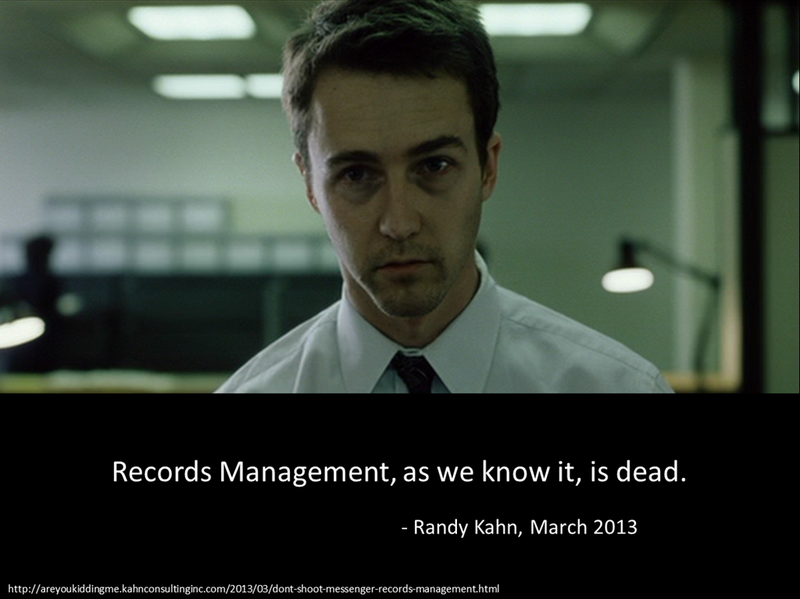 Randy Kahn wrote a great article a few months back saying that Records Management, as We Know it, is Dead. It isn’t that the need has gone away, just that what we are doing isn’t working. We need a new approach. We have asked employees for years to do some of the heavy lifting in classification. It has worked in some places, but not in others. People don’t need more things to do. We don’t hire knowledge workers to classify documents and make sure that the company is compliant. They don’t like doing it, so they don’t. The more we force them, the more they resist. Sure, there are Change Management techniques that are designed to help increase adoption, but they don’t always work. From the failure rate we have seen, one could argue that they don’t work at all. And yet, the business requirements behind Information Management are still real. We, as Information Professionals, still have a need to meet the needs of the organization. That is also why we have failed. As the buyers and influencers, we have educated the traditional Enterprise vendors about our needs. They have been building software for the Enterprise. Not for the Users of the software. That is the disconnect. We have been deploying software that was designed for corporate entities and expecting actual human beings to use it. Want proof? Look at the viral nature of these cloud apps. Have you EVER heard a traditional Enterprise software product described as viral? How about a whole class of products? Dropbox, Box, and the others are gaining traction by making the lives of the People easier. Some, like Box, have decided to add Enterprise features. When they do, they agonize over it because they have one simple mantra. Not the Enterprise. Not the legal department. The User, a human being. And that is why people are adopting their tools. That is why they are winning the war. Right now, the war isn’t over. It is still possible to meet in the middle. You can choose to fight, but you will loose. The cloud vendors will always be more nimble and agile at making their tools more accessible than you will at restricting their use. We need to come together and gain an understanding of the other side. Most companies in Silicon Valley want to help. They want to solve the problems. Enterprises want success. They want to make progress. Enterprises are just tired of failure. Right now there is no guaranteed winner coming out of Silicon Valley. There are leaders, but no winners…yet. Enterprises still have influence and can still impact the future direction. Don’t try and sacrifice the user experience in the process. We did that and failed. Miserably. We need to focus on the high-level needs (not 200 lines of requirements) of an organization and work with the vendors to create innovative new ways to solve our problems. We must work together, or things will get more fragmented before they get better. Hi Lawrence, yes it is a kind of war. But that is simply how business works and therefore also the software business. As I did mention before Cloud services accessible through Mobile is just another way of outsourcing. Working together is always good, but clearly that is hard to demand from someone who is clearly winning the war. Cloud vendors will just set the conditions for a surrender. Not a truce, but a simple and full surrender. I will tell you why. I am sorry to say sp, but you are barking up the wrong tree. Yes, it is the IT departments who are not delivering what is needed, it is the huge enterprise software vendors who are not innovating and it is the analysts who mostly report on the past. But in the end it is the executives who set corporate strategy who are stuck in cost-driven ‘MBA-professional- management’ mode. The line ‘we are not in the software business’ has been lasered into their foreheads. They find it hard enough to understand what their business is doing and much, much less what is going on in the IT world. It is not IT who is worried about loss of control. It is the C-level who is worried to let go of the little grip they have on things. It is really hard to keep the huge contraptions that pretend to be efficient enterprises running. It requires A LOT of creative accounting. The main reason for constant M&A activity is the opportunity for goodwill and writeoff numbers on the balance sheet that you can chose as per your liking. The C-level allocates budgets for new IT solutions and they simply don’t because what IT does is to create more complexity and more murky enterprise integration so that they can’t be fired. And then there is this: ECM and records management are dead-ends. You might want to change the name again to Information Management in a try to reanimate it but at some time the heart goes into so-called decomposition and thats it. IM does not provide anything to run a business better. It is purely seen as a necessary expense and therefore the cost must be as low as possible. As I wrote in my comment on your previous post, what the business needs and what the C-level must be shown is that content is what runs their business processes. But you can’t show that when you do nothing else than to stuff it into a content graveyard (=records management). And processes are managed as stupid flowcharts rather than business goals. Once the content comes alive meaning dealing with inbound content not as a blob but as a mix of data and instruction, and creating outbound content as a mix of data and instruction and that in CONTEXT with the business capability goals, maybe then business management and the C-level might understand. The way it looks right now, it will also be the Cloud vendors who will bring that consolidated functionality and not Enterprise IT. Clearly executives do not really care how they get what they need, but they want it fast and cheap. Both things enterprise IT does not deliver. Thus, the war maybe over before it began.